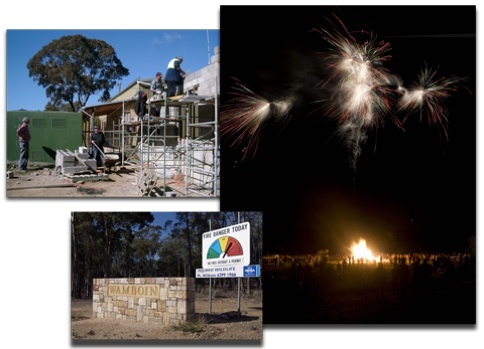 The Wamboin Community Association is a group of residents whose aim is to unite the Wamboin community through the promotion of its own events and activities, and those of local community groups. In addition to a monthly Home Produce Market, we run a number of annual events, including a Curry Night in August, a Bonfire and Fireworks Display in September, and a Carols Service in December. We also coordinate the local Clean Up Australia activities in March. The Wamboin Community Association meets on the third Tuesday of the month (except January), at 7.30 pm, in the Wamboin Community Hall located at 112 Bingley Way, Wamboin. Residents, visitors or anyone interested in the Wamboin Community are welcome. The WCA Constitution and other association documents are available for download. Contact details for current WCA office bearers are listed on the Contact page. The Wamboin New Residents' Pack is available for download.